Alive Studios is adding two new components to its Math alive augmented reality system designed for pre-K and kindergarten (and for grades 1 to 3 as an intervention). Math alive uses a combination of zoo-themed flash cards and video input to create augmented reality experiences designed to engage students and help them learn math concepts — without the use of 3D glasses or goggles. One of the new Math alive components, My Math alive Student Journals, is designed to help students learn numbers and shapes and reinforce that learning with a variety of tools, including badges. The Math alive Student Journals also include a free mobile app for Android and iOS. According to the company: "With the simple-to-follow book and free mobile app, young learners have access to a menagerie of zoo animals that help them learn number recognition, counting, and number writing, as well as 2D and 3D shapes. My Math alive Journal is designed for both at-home and classroom use, which promotes family engagement and a strong relationship between home and school. Journals can be purchased individually and also in 20-packs for whole classes. My Math alive Journals come in pre-K and kindergarten versions, with age-appropriate activities and challenges." My Math alive Journals will be available May 1. Individual journals will cost $9.95 for either pre-K or kindergarten. 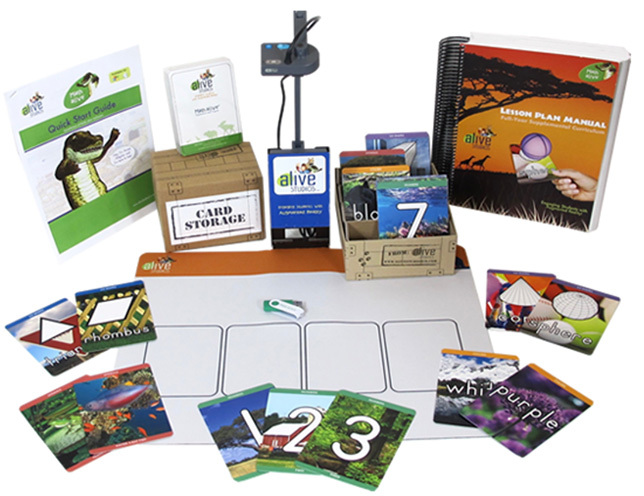 Classroom packs (20 journals) will run $159. Further details can be found at alivestudiosco.com.